You can make your own bouquet for $30! 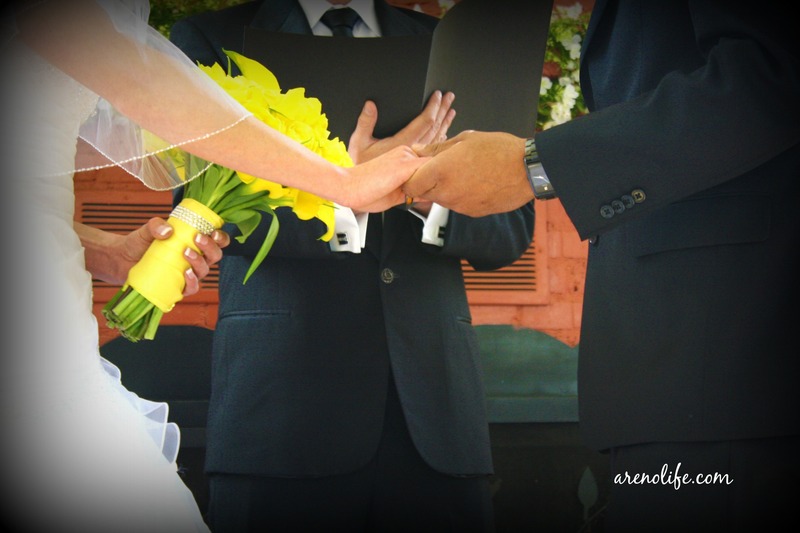 Our wedding colors were yellow and charcoal. 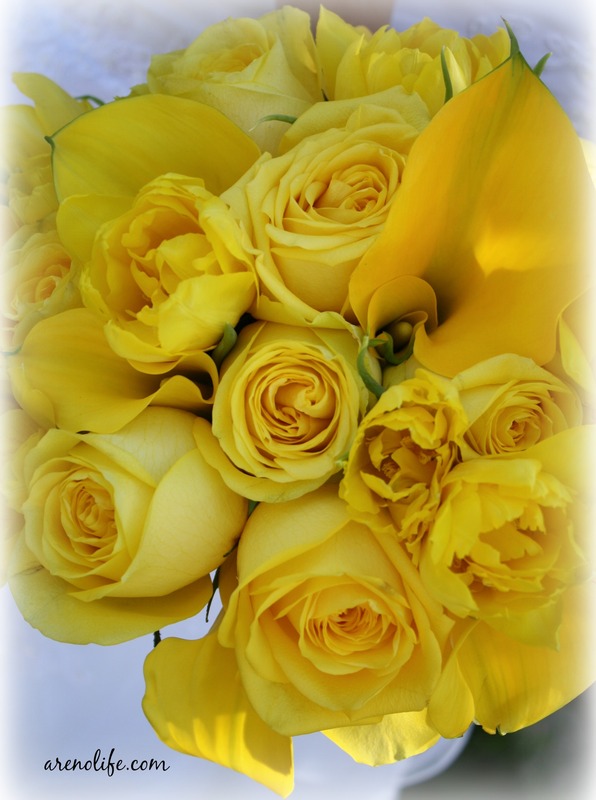 I ❤ orchids but they were out of my price range…so I moved onto my other favorite flowers = yellow roses, calla lilies and tulips. I went to Whole Foods and the florist was GREAT! She ordered all the flowers I wanted, I took 1 bundle/dozen of each and then just paid for what I took. Yup, that’s right! I didn’t have to pay for the whole case and just ordered my flowers 3 weeks in advance. The florist picked out the best bundles for me to choose from before putting the rest out for the public to buy. 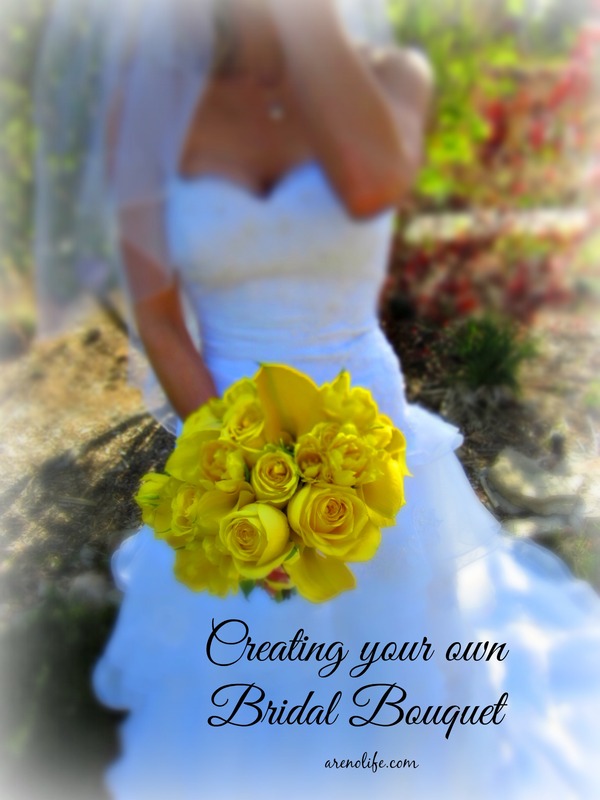 I wish I had photos of the process of this but….I don’t…I didn’t have my blog back then….HOWEVER, gather the flowers that you want in the center of your bouquet and start adding flowers around them. Every now and again, put a rubber band around the stems to help hold your bouquet together. Also, turn your bouquet while assembling it. This helps balance it out and you don’t have to worry about a “good or bad” side. We tucked the ribbon into the rubber bands (the very one holding the whole bouquet together) to start the (ribbon) wrapping process of the stems, and then used another rubber band around the base of the fabric. Wrap your ribbon around this last rubber band to cover it. Cut your ribbon and now, tuck the ribbon end piece back up into the rubber band. Now your ribbon is secure. You could use hot glue….but I was worried the heat would damage my flowers to I went with rubber bands….and just hid them. I did this project, the night before my wedding and it took about 1 hour. Place your bouquet in a vase that is filled about 1-2 inches of water so the base of the flowers are in water but the whole bouquet is not soaking it. You don’t want the water to wick onto your ribbon. If you want to start the process of wrapping your bouquet but are truly scared about the water wicking, wrap the top of the bouquet, pin the ribbon, and dangle the remaining ribbon outside of the vase until your wedding day to just quickly cut and finish. I also added some “Bling on a Roll” (it’s literally called that at Michael’s) to the ribbon for some fun. The Bling on a Roll is self-adhesive so just go slow and it made a perfect circle around my flowers. I just cut the end and make a second “layer” below the first to get the thickness that I wanted. The Bling on a Roll, comes if different sizes, colors, shapes, etc. By the way, I cut the bottom of my bouquet with really good kitchen shears. The knife method did not work for me.